When conducting prospect research for your next fundraising campaign, there are countless types of information that you may find useful in your evaluation of whether an individual is a strong prospect. Just remember that all data is not equally meaningful when it comes to fundraising! For this reason, we have compiled a list of the eight most essential types of data that you should include the next time you conduct prospect research. 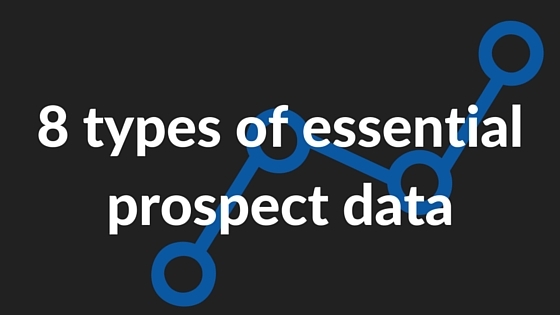 Each of these data types brings its own valuable predictive qualities to the prospect research table. And we’re going to cover every item on this list in depth. If you want to jump ahead to a particular data point, click on any of them to be directed right to that section. Otherwise, let’s begin at the top of the list: Previous Donations to Your Nonprofit. Recency of the last gift: When did the donor last make a contribution? Frequency of giving: How often does the donor give? Monetary contribution: How much has the donor given? By combining these three factors into a super-score of sorts, you’ll have a much clearer sense of how to prioritize your outreach to existing donors. The drawback of this data is that it doesn’t allow you to identify individuals who made small donations previously but have the potential to become major donors. In order to do that, you’ll need to combine your analysis of prior giving to your nonprofit and various other data points we’ll be touching on throughout this article. Research has shown that past charitable giving to other organizations is one of the best predictors of whether a prospect is likely to make a donation to another nonprofit organization. Many nonprofits make their annual reports and recognition documents available either online or in-person, so there’s the possibility to cross-reference your donor base with other nonprofits’ giving data. However, some internet-based annual reports are taken down over time, and publishing annual reports online is not a regulatory requirement. This means that the data available online may be a fraction of all gifts made. 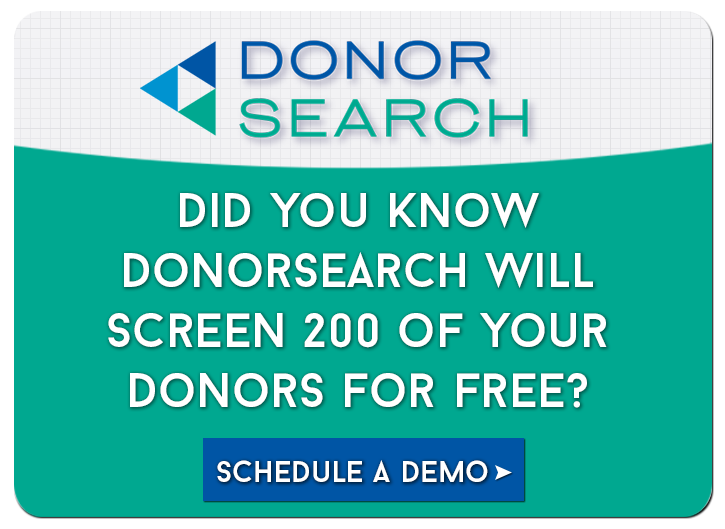 If you already subscribe to DonorSearch’s online research tools, make sure you are utilizing our Annual Report Philanthropy Database. It’s already the second largest collection of charitable giving data available anywhere and is growing quickly by 50,000-100,000 records per day. It is a proprietary philanthropic database that includes hard-to-find print references and internet-based annual reports harvested from nonprofit websites. This comprehensive collection spans seventeen years, with millions of records from the mid to late 1990’s, even better coverage for each year of the previous decade and one of the fastest growing collections for 2010, 2011, and 2012. The database provides access to giving information that was previously published on the internet, but is no longer available, and the broadest collection of printed documents not available elsewhere. The amount someone has given to political campaigns is a good indicator of how much they’d be able to give to your organization. If someone is regularly donating large sums of money to political campaigns, they’re likely major-gift-qualified prospects for your organization. The fact that someone is willing to donate to a political campaign speaks to their openness to take action. When a person makes a political contribution, they are essentially recognizing a cause they care about and doing something about it. If your nonprofit can inspire the same kind of passion in your cause, you’ll be in good shape! Plus, political giving also speaks to a prospect’s interests. For example, imagine your nonprofit’s mission focuses on arts education. You might find that your prospect donated to the political campaign of a senator whose platform involved increasing funding for arts education. You can leverage that aligned ideology to better connect with your prospect during cultivation. Convinced of its value? Simply head over to FEC.gov and perform a quick search (you can read more about the tool in our list of prospect research resources and tools). Nonprofit involvement indicates that a prospect understands the value and the importance of philanthropy – this is especially true of any prospects who sit on foundation boards as trustees. Fortunately for nonprofits trying to conduct prospect research, foundations are required to report their trustees, and GuideStar has made that information available through a search function on their website. Additionally, if you can successfully solicit a gift from someone involved in other nonprofits and steward them into loyal donors, you’ll be able to leverage their connections down the road. When you’re actively seeking major gifts, every connection counts. Picture the difference between one of your major gift officers cold calling a new prospect versus one of your loyal and active donors making the introduction over a shared lunch. It’s incredibly valuable to have donors who are prominent in the philanthropic community. They’ll be able to help you expand your network. And that expansion starts with recognizing those involved in nonprofit work and cultivating your relationships with them. Let prospect research highlight who those candidates are. Using a screening tool to do the heavy lifting and not only find the real estate holdings but learn what they mean and could predict. Scanning a real estate website, like Zillow that we mentioned earlier, to figure out property values. Checking with the county tax assessor for official records of purchase prices and property values. How does property value change if you adjust for inflation in certain cities? Is this property a main residence? Business venture? Vacation home? Stepping back from the data and seeing how it fits into the larger image you have of your donor. Learn more about investigating a prospect’s real estate holdings here! Whether they sit on any corporate boards. Often, gaining greater insight into a prospect’s professional life can also act as window into their financial life. If you know what someone does for a living, you should be able to extrapolate a rough estimate of salary and similar factors which play into total wealth. Just like you can leverage the relationships of donors involved in other nonprofit work to meet new prospects, you can take a similar approach to those supporters who have strong business ties. Professional affiliations can be the key to a whole new world of supporters. In other words, business affiliations are vital in developing your organization’s grasp of not only the prospect’s potential as a donor but also the prospect’s potential as a supporter. Another publicly available type of information is SEC stock holdings at publicly traded companies. This data is reported to the SEC and provides insight into an individual’s capacity to give. Keep in mind, SEC Insider Stock Transactions are one of the top wealth markers, but they don’t tend to speak to philanthropic capacity. Essentially, this information may have limited predictive ability for an individual’s willingness to give. Plus, any ownership of privately held companies won’t be captured. Those notes aren’t to say that you shouldn’t take advantage of the financially predictive capacity of SEC stock holdings. They’re just meant to point out that stock ownership should be one point amongst the group and not the driving indicator. On the whole, prospect research is a holistic process. You should aim to be as comprehensive with your investigation as possible. That’s why we place so much emphasis on philanthropic research. Delve further into the role of SEC holdings in the prospect research process by studying up on the wealth screening guide! What’s more, personal information will often be needed as an input to research other types of data. Any endeavor should build out from the basics, and prospect research is no exception to that rule. Prospect Generators: 4 Essential Tips to Find New Donors. These tools can drastically expand your prospecting horizons. Learn how a few simple steps can get you started. 23 Questions to Ask All Donors and Prospects from Bloomerang. Continually learning more about your base of support goes a long way to refining your prospecting strategies! Hiring a Prospect Research Consultant: 5 Considerations by Donorly. Taking on an expert guide is the right choice for many organizations. Learn how to make the most of that partnership.